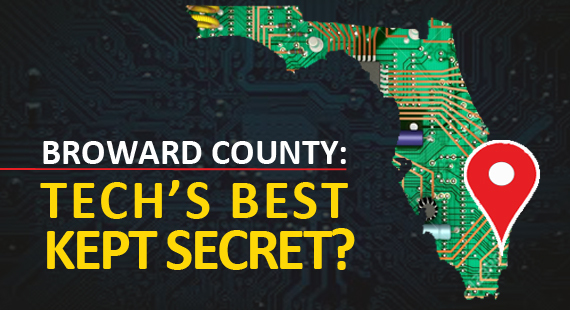 Is Broward County the Best Kept Secret in Tech? Leaked photos of Apple’s iPhone 8 has the Internet buzzing. As rumors about wireless charging and a curved display swirl, the 10th anniversary of the iPhone is a reminder of just how dependent we’ve become on mobile technology. Before the smart phone went mainstream there were no apps, social media platforms were limited to desktops and laptops (imagine that! ), and texting was something straight out of the Jetsons. But while the tech giants of Silicon Valley might have perfected the idea of a computer in your pocket, many are surprised to learn that the first smart phone — the Simon Personal Communicator — wasn’t developed in a garage in Cupertino, but rather in a suburban office in Broward County, Florida. While Spring Break revelers were taking over Fort Lauderdale Beach, engineers at IBM were hard at work perfecting a one pound phone which was the first to incorporate both cellular technology and computing power in a single device. The price: $889. And with that, IBM had set a mobile revolution in motion. It was 1994, a full 13 years before Steve Jobs would introduce the world to the iPhone. Lots of cities have laid claim to being the next Silicon Valley (Kenya calls itself the “Silicon Savannah”; Philadelphia has coined the moniker “Philicon Valley”; and Chile is, naturally, “Chilecon Valley”), but Broward may have a leg up on all of them. Home to a solid base of existing tech companies, 40 colleges and universities, easy access to Latin America and Europe, and relative affordability compared to competing markets in the northeast U.S. and west coast, it’s no wonder why Broward has become a breeding ground for entrepreneurs. Household names like Blackberry, Oracle and Microsoft all operate regional headquarters in Broward. They’re joined by homegrown upstarts like Google-backed Magic Leap, an augmented reality company that was recently valued at more than $4.5 billion; Chewy.com, an e-commerce pet supply brand that was acquired by PetSmart; and JetSmarter, the fast-growing private jet firm billing itself as “Uber of the sky,” which recently landed more than $100 million in funding. All of this activity is fueling job growth. Broward boasts one of the lowest unemployment rates in Florida, 3.8%, and the County has added nearly 30,000 new private sector jobs over the past year alone, with tech being a key employment driver. The next challenge: keeping talent (and the companies that rely on that talent) in place amidst intense competition from other markets. Broward County’s official economic development agency, the Greater Fort Lauderdale Alliance, is working to sustain this momentum. Alliance CEO Bob Swindell detailed his organization’s efforts to cultivate and retain local talent in a recent Miami Herald Q&A profile. “The best way to fight brain drain is to give people a reason to stay in the first place, and a way to make their mark in our community,” explains Swindell. The Alliance is working with a local companies and universities to expand internship programs, jump-start new research projects, and narrow the skills gap that exists between employers and the workforce. With zero state income tax, an average year-round temperature of 75 degrees, and a growing number of tech companies calling South Florida ‘home,’ Broward figures to be in good shape — no snappy nickname required.